Even though I’m not part of the “horsey set”, I still managed to fall head over heels for this charming coach house in Style At Home. The deep dark wood tones with all of the neutral linens, Gothic architectural elements and pops of “Hermes orange” are so entirely appealing. I just love equestrian chic interiors. So do I! Something about equestrian chic that definitely speaks to me. 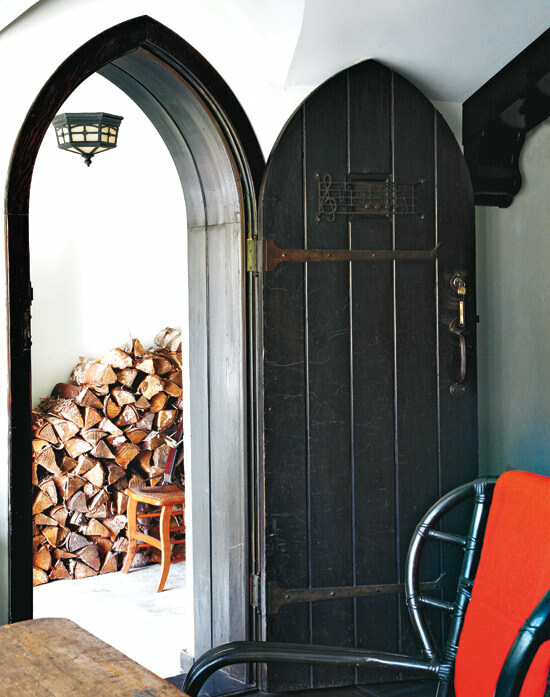 Love the gothic door and window and that little quilted banquette next to the fireplace is fabulous! You can take a gal out of Kentucky, but you can never take the Kentucky out of a gal….and my love for the horsey set. I love Horses…the lucky horse shoe, the Derby, Mint Juleps, the run for the roses…and all that goes along with! Giddy-up! I think I need another house dedicated to equestrian chic. 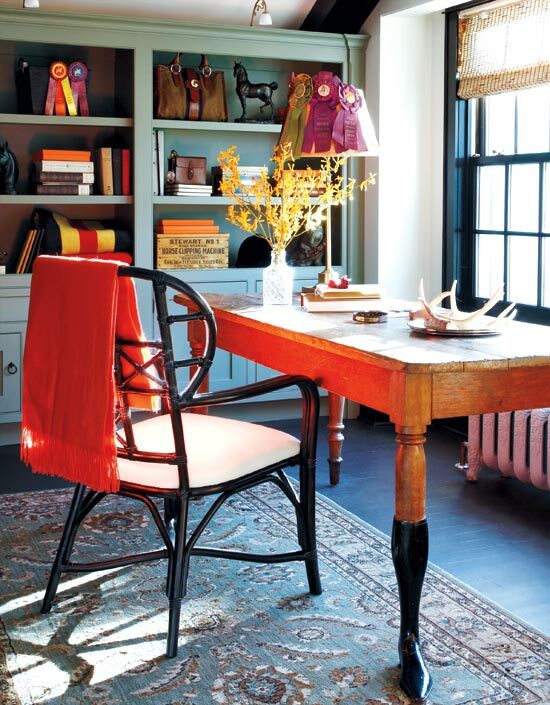 Love all the pops of orange, I think that keeps is fresh and it helps to pull one's eye around the room. I was quite fond of some of the "horsey" items at Two's Company at the NYIGF…especially the frames…although, I'm not from the "horsey set" either so I'll admire from afar. 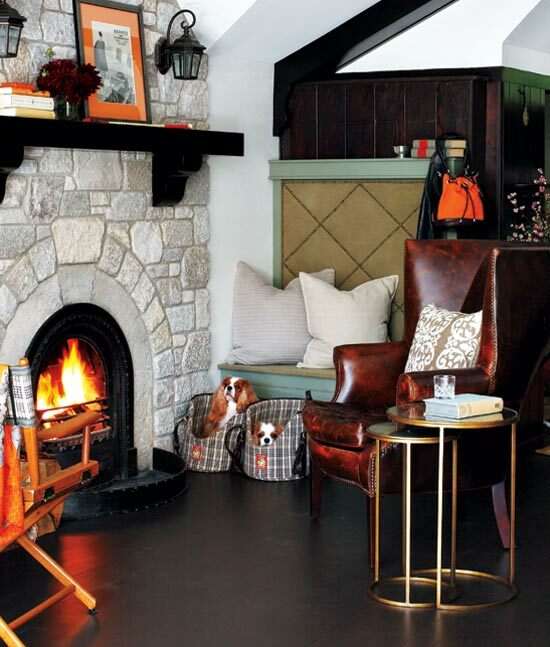 That leather chair and a cozy fire place, just the right spot after a ride. Very nice display of Ribbons too. Charming litte spot. This is wonderful. HAving grown up in the country and having horses, I must say that our abode never looked as chic as this! Are you sure they have horses? You know I LOVE it! Let's crash this place and "borrow" some of this stuff! This is all so cozy and horsey chic- loved it too. I don't ride either, but my daughter just took it up this fall so I'm living vicariously through her. Love the equestrian look! These rooms are great but what I really love are the pieces of orange in every room. Beautiful! It's a lot of horsing around in this room. Ok. Maybe that was a bad joke, but it still is a lot of equestrian references…BUT it works so well. Love the warmth of these rooms. And the pops of orange are so fun. The King Charles Spaniels cozied up in their bag like beds by the fire are just adorable. These rooms feel like home. Thanks for sharing these. Good Morning dear. All lovely but the orange really adds to the coziness. Check out the legs of that table. Are they supposed to be riding boots?! How fun! Wonderful, especially in the details. "Whoa" is right… and so clever, I might add! Just had a long horse show dream last night. I still have them almost 20 years after the fact. I'm the same, love equestrian chic even though I've never really been around horses. They seem to be such noble creatures, so beautiful and such graceful power. I often fantasize how I would look in riding boots! Love horses and all things equestrian. Whoa is right – these were some amazing images, full of inspiration! Want to meet at the stables? I love how regal it is and very refined. Makes me miss riding so much more. Love, love this. All of these images are gorgeous, and the little doggies aren't bad either! Have a wonderful week, Sue. Ouch!! You are making me miss the track. I haven't been in a year. Sadly nobody goes anymore. I do have a wonderful print of the tragic Phar Lap by Richard Stone Reeves. Its all about the underdog in racing. The best of all are the Paintings of Sir Alfred Munnings. They are beyond reach, but the light is heavenly. Yes, I love a bit of the horse in my decor. I should have thought of it myself!! I'm not a huge fan of orange, but I love the way it pops in this room! I do love equestrian chic, but OH those puppies! I never would have said I was a fan of this look but you have convinced me otherwise. Gorgeous! It's fabulous. I love interiors that lean towards a more masculine look. I'm swooning over that door. Whoa yeah! Love that door, and the white bag in the first photo too! The first photo is fabulous…"horsey set" or not!! What a charming place! I love how they have used the purse as a decoration. Love this space and of course, the little doggies too! Oh I love it! I want to live there!! 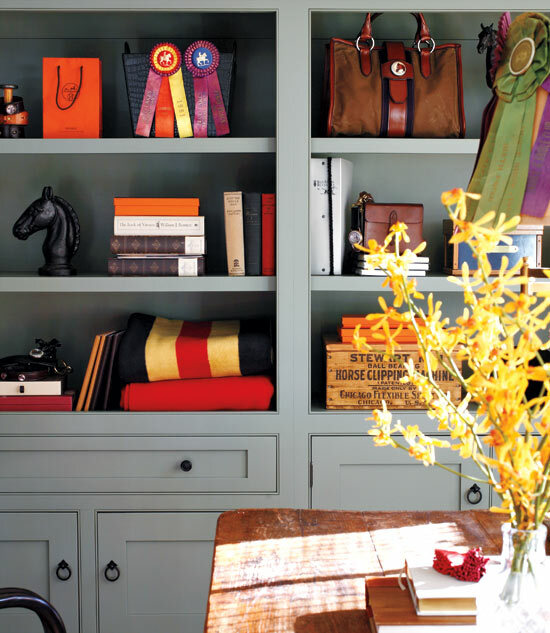 The dark wood and the pop of orange is just gorgeous (and how could one not appreciate Hermes boxes?). Love the shape of the window in the first photograph. Swoon. Seriously swooning. Um YES, I love me a gothic arch or two. I like how it manages to be moody and fresh at the same time. I loved it too! I'm digging my old show ribbons out of the basement. No surprise- Im in love. Your "whoa" comment at the end of your post made me giggle out loud…great sense of humor! I also made a funny little noise when I saw the legs on the desk… And, as always, I am crazy about any doors that have a "moorish vibe".